Description: East bound crossing Kiefer Creek, in Castlewood State Park. 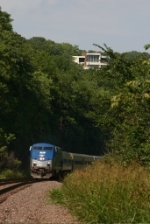 Description: Westbound Amtrak 303 passes through Castlewood State Park. I hope the people who live in the house are railfans; they have a great view both the West and East. Description: East bound coal train track 2 MP 26 (Allen Rd overpass). 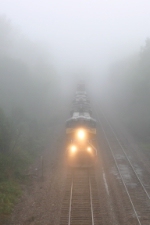 Description: West bound stack train emerges from the fog at M.P. 26 (Allen Rd overpass). 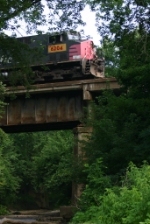 Description: UP 6616 leads a east bound coal train a cross the Meramec River. The photo was taken from Route 66 park. Title: UP Local Infrared. Sherman Park. 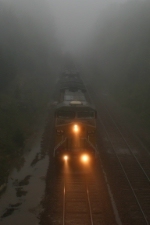 Description: The UP Local crosses the Meramec River on its way back to St Louis. Photo was taken with a Canon G1 modified to take only Infrared photographys.